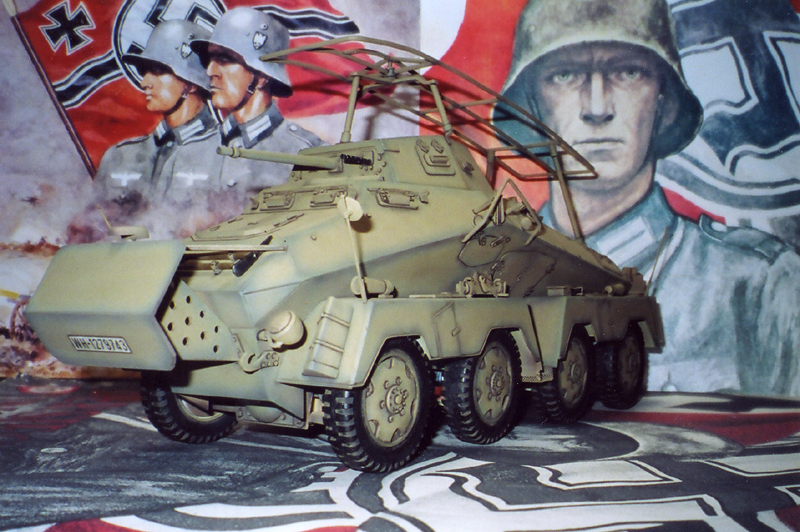 PANZERSPAHWAGEN ARMORED CARS (SDKFZ 231,232,233) IN 1/15 SCALE. The most spectacular armored scout reconnaissance vehicles were the eight, six and four wheeled armored cars. These armored cars which supported the Panzer units attracted much attention by their high speed. The main body of the German reconnaissance battalions to which these corps belonged consisted of unique-shaped armored cars which had a linear and graceful shape characteristic of German military vehicles. They were the most modern and represented the technical high-point of the construction of armored wheeled vehicles ever seen. And because of their good-looking form along with its modern technology in the service of armored scout car development, they are still admirable vehicles even today. Armored cars were designed for the vital role of reconnaissance, ranging ahead of the advancing Panzer spearheads to asses enemy strength and intentions. These reconnaissance armored scout vehicles were the eyes and ears of the army, and were to show activity as �The eye of the division� and �The eye of the commander� in the greatest conflict of all time: World War II. In this struggle there were no spectators, rather only participants. And no neutrals, rather only combatants. That meant, in this gigantic struggle every fundamental issue was contested, so that nobody, not even the last European, could evade a clear stand, a clear stand that had to be taken by more than just the European states, their governments and chief of states, no� the unique thing about this struggle was that each individual member of the European folk had to make a contribution to the decision regarding his nation�s future. And each European was proud that the decision of many individual young European men did not stop with words, rather that they voluntarily risked their lives for the European cause to the honor of their own lands, and all proved their manly bearing through the deed. When a strong power emerged again in the heart of Europe in the German Reich, the English World Empire immediately addressed it as an enemy and fought it with hatred. The German Reich sought to pursue its own path, to practice independent politics and to solve its economic and social needs by itself, in short, Germany wished to pursue politics independent from the �City of London� and stand on its own feet. The German Reich was systematically encircled by England. A coalition war such as the world has never seen was unleashed against the German Reich. But when it was not possible to defeat the German soldier in honorable combat, Germany was decayed and defeated with all the tricks and baseness of politics after the armistice of 1918. England�s victory appeared complete after the Treaty of Versailles. All power, all state sovereignty was torn away from the Reich. The fall of the German folk seemed to be just a matter of time, large portions of the severely tested German folk fell victim to the stressful and oppressive pressure of the insane Treaty of Versailles. It was obvious that in time that the German nation declared a fight to the death against the Versailles system and its supragovernment wire-pullers and the ancient evil in Europe that wished to finally destroy the German nation that has always fought with European responsibility. Everywhere that Europe is entered in the annals of history, the name of Germany has always shinned towards it. Without the German nation there is no Europe. Only through the German state did Europe became the heartland of the world. So Europe and the German state appear as concepts that have grown together, one is inconceivable without the other. Soviet Russia had only one wish, namely to so weaken Western Europe in a civil war of attrition among themselves, so that, as a declining continent, they would fall easy prey to a satanic attack by the Bolshevik rulers of the world pest of Communism and its world destroying objectives. So therefore, the German state places itself in the service of a divine law of nature that is Europe�s Constitution and fought this threat with European responsibility and the sole goal to defend Europe as the ancient homeland. It was a task that every European should applaud. Only so can the �Decline of the West�, Soviet Russia�s ultimate goal, be prevented. It had already become clear to every European conscious of his kind, that this task is hence no longer the protection of individual countries, rather the protection of Europe and its 2000 years of the highest civilization and hence the salvation of all against the total Bolshevization of the European continent. The crusade against the world pest of Asiatic Communism (The mortal enemy of European culture) was enthusiastically embraced everywhere. Volunteers to arms poured in from all of Europe�s lands in growing measure and wanted to indeed do their duty as Europeans. The goal of eastern Communist Bolshevism is to bring chaos to the western European continent and the Bolshevization of every country and people of the world. Germany was the only country dealing with this eastern infernal political devilishness that does not recognize the norms of human behaviour used between nations. The European powers were facing their most critical question of survival, western Europe was in deep danger. The German nation was not willing to bow to this danger, behind the oncoming soviet divisions came the liquidation commissars, and behind them terror, mass starvation and complete anarchy. International Communist Bolshevism was the devilish ferment of decomposition that finds cynical satisfaction in plunging the world into chaos and destroying ancient cultures in which it never played a role in building. Therefore Germany was the only European country who knew its historic responsibility. Two thousand years of western civilization were in danger, They could see, if the danger was not overcome, the ghost of hunger, misery, and forced labor by millions of Germans. They could see their venerable part of the world collapse, and bury in its ruins the ancient inheritance of the west. That was the problem Germany faced. Eastern Bolshevism was not only a doctrine of terrorism, it was also the practice of terrorism. It strives for its goals with an infernal thoroughness, using every inner resource at its disposal, regardless of the prosperity, welfare, or peace of the ruthlessly oppressed nations. Again, Communism reveals itself as the incarnation of evil, as the plastic demon of decay and the bearer of an international culture-destroying chaos, In resisting this life-threatening menace, the German nation was fulfilling in the truest sense of the word a European mission. Its courageous and just battle against this world plague of Communism and its devilsh ideology. The real history of World War II compels our attention, long slandered by distortion or omission by the powers which seek to control our thought and suppressed in the controlled media. War criminals? Victims of Hitlerism? Now you�ll be able to judge for yourself.